Once strictly known as a tobacco town, the Camel City is reviving itself through technology and the arts in such a way that’s prompting the world take notice. Completed in 1929, just as tobacco was crowned as North Carolina’s king, the Reynolds Building served as the shorter-but-older brother prototype for what would then be the world’s tallest building from 1931 to 1970. The building’s ties to the Big Apple landmark were one of the first things about this city that struck Bryan Ledbetter when he moved here 17 years ago. That, and the friendliness of those who live in Winston-Salem. “You’re in a place that you’ve never been, but everybody acts like you’ve been there forever,” Ledbetter says. Ledbetter is the owner of Airtype, a design and brand agency, and its offshoot clothing business, Camel City Goods, which specializes in fashion-forward T-shirts that immortalize unsung aspects of Winston-Salem’s legacy. Before this gig, Ledbetter toured in a rock band. He knows a hit when he hears one — or in this case, moves to one. 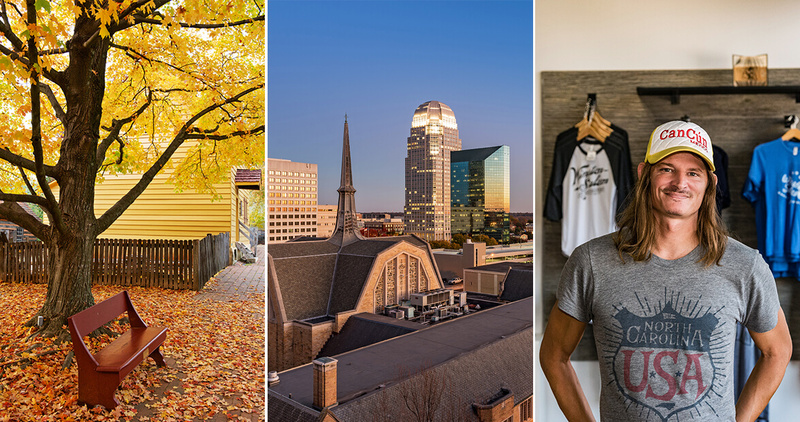 In many ways, Winston-Salem is North Carolina’s Renaissance city. You can’t talk about its history and not mention tobacco, but these days, you’re more likely to hear talk of the arts and biotechnology. Once a place that excelled at just a few subjects — tobacco, textiles, and banking — has become an anthropomorphic Michelangelo, mastering so much more. Now the world is taking notice. 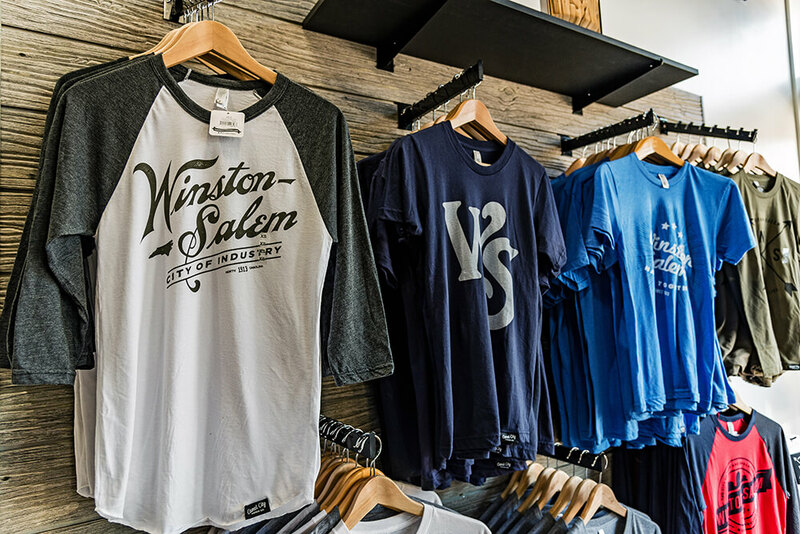 From the Camel City Good’s store in the West End district, Ledbetter is one of many who hope to shape Winston-Salem as momentum continues to build around this city. “It’s a magic that probably happens once every centennial,” he says. And it’s one that hasn’t been felt since the days of Reynolds and Hanes. In the 1920s, Winston-Salem was the largest city between Atlanta and Washington, D.C. At one point, six Fortune 500 companies were simultaneously headquartered here. Prosperity was the scent of tobacco that blanketed the city for decades. 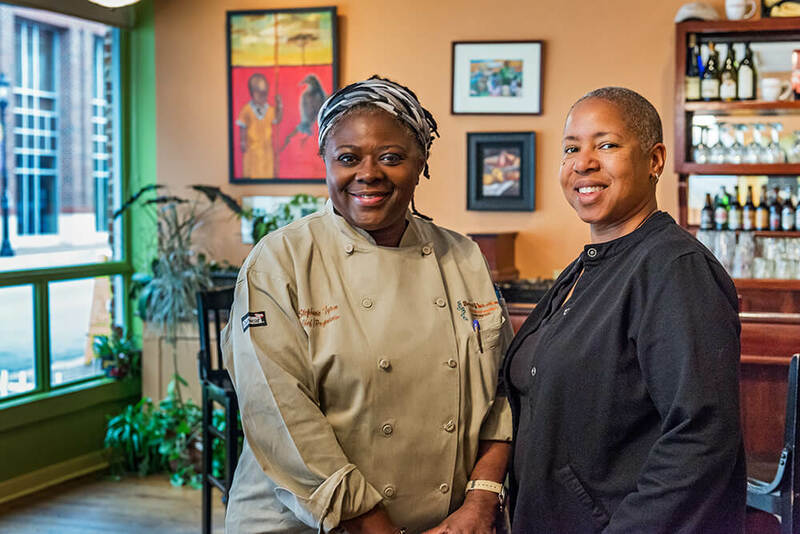 “I knew I was close to home coming down Interstate 40, because once you got to Fifth Street, you could smell tobacco,” says Stephanie Tyson, who is the chef at Sweet Potatoes. Then the late 1980s happened. R.J. Reynolds Tobacco Company planned to move its headquarters to Atlanta after a merger with Nabisco. A year later, Reynolds was bought out. Thousands of workers lost their jobs. Tobacco shortens life expectancy, but the livelihood of workers and families in this town largely depended on it. Tyson, who grew up in Winston-Salem, remembers when no one would venture to the neighborhood where Sweet Potatoes now stands. In 2016, Sweet Potatoes and its Arts District surroundings feel comfortable. A cross section of families and work colleagues munch on succulent fried chicken sandwiches and tender collards, engaging in repartee about the pronunciation of the word “pecan.” Bouncy jazz music fills the dining room, matching the cadence of pedestrians who flit past the windows. After Sweet Potatoes opened in 2003, life began to take root in this once desolate part of downtown. The restaurant now neighbors boutiques, a French bakery, and a music shop. “Once we got a foothold down here, people began to say, ‘OK, if they can do it, we can, too,’” Tyson says. This city is being rebuilt on the chances its residents take. Chances on ideas. Chances on people. “You can feed someone just by nourishment of food, but you can also feed the spirit,” says Vivián Joiner, who owns Sweet Potatoes alongside Tyson. 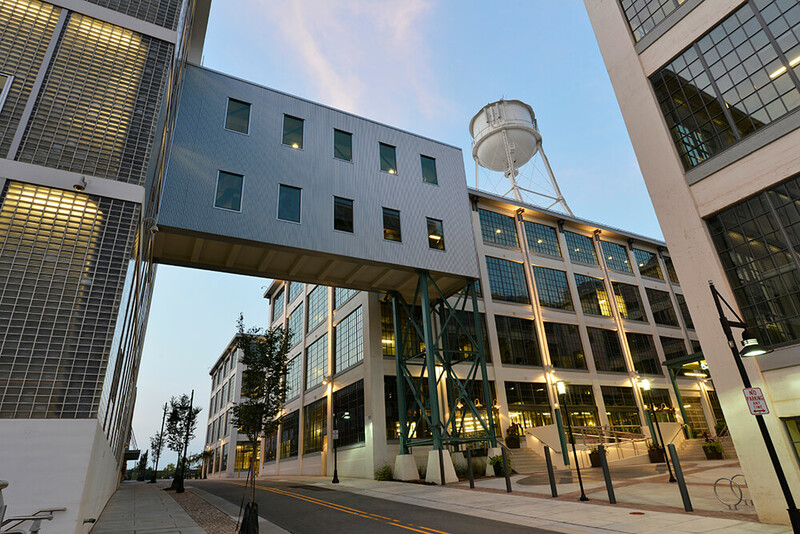 A large catalyst in the revitalization of Winston-Salem is the Wake Forest Innovation Quarter, housed within the old Reynolds factory complex. What was once a reminder of the collapse in manufacturing has become a live-work-play environment that’s fueling new creative industries, which are uplifting the community from every angle. The Innovation Quarter is home to a co-working space, Flywheel, which has served as incubator for startups that do anything from designing virtual reality content to creating an app that streamlines charitable donations. In 2014, Forsyth Technical Community College opened a small business center at the Innovation Quarter that’s helping the workforce bolster its skillset to meet the changing demands of industry. And when those creative types need to take a breather from innovating, they can head to the quarter’s Bailey Park for a yoga session or food truck run. But there’s a more succinct word that explains this widespread metamorphosis that Winston-Salem is experiencing: heart. From 2009 until the spring of this year, the Reynolds Building sat empty. But even when it was vacant after its namesake company moved to the Plaza Building next door, there’s this: The building was cleaned top to bottom, every day. The luxurious Kimpton Cardinal Hotel now occupies five of the building’s floors, and apartments make up the rest, and it’s all due in part to the foresight that went into preserving it. Il Duomo di Firenze was the Italian Renaissance’s answer after the Dark Ages. The Empire State Building was a symbol of hope during the Great Depression. And in Winston-Salem, here stands a not-quite-as-tall reminder of revival, which boasts a perfect vantage point of the good that’s happening below.